There are plenty of scenes throughout director Ishiro Hondo’s 1956 film “Godzilla” of the sea monster smashing his long lizard tail atop Tokyo buildings. It’s one of many acts of destruction Godzilla does so well. But the tail I think of when reminiscing about Godzilla has nothing to do with a man in a rubber monster suit stomping atop a model of Tokyo. My mind rests on a simple length of masking tape with the word “Godzilla” stenciled in green marker alongside a cartoon sketch of the famous movie beast. The tape is attached to the final thread of film on the last reel of the uncut, original, Japanese version of the film, which I helped project for a series of shows at a Cincinnati cinematheque. But the original Japanese version of “Godzilla” never played U.S. theaters until recently. 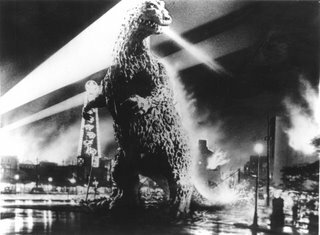 Stripped of the added scenes featuring Raymond Burr’s reporter and the dubbed English, “Godzilla” is sober, solemn and fantastic to watch. Adult film fans in the crowd appreciate the film’s morality, the seriousness that makes “Godzilla” more than a creature feature. Hondo, a former assistant to Akira Kurosawa, makes the most out of Takashi Shimura’s role as a sympathetic scientist who wants to study the underwater creature blasted awake by an H-bomb explosion. Midway into the film, a young woman is asked if she plans to evacuate Tokyo if Godzilla heads their way. She answers with a definite yes. After all, she survived the bombing of Nagasaki and is not about to jeopardize her life. Children in the crowds may not instantly connect with the morality of “Godzilla.” They’re more interested in the beast’s path of destruction, his first appearance above a rural hillside and his fiery demolition of Tokyo. The clever way Honda keeps Godzilla hidden in nighttime skies is lost on movie kids who want to see everything. A swishing tail crashing against Tokyo apartment buildings doesn’t cut it. After watching the movie, my seven-year-old son promptly declared the movie as “lame.” Godzilla, he told the people exiting the cinema, just wasn’t scary enough. Of course, that didn’t stop him from having nightmares later that night. X-Men to the World: Take Us Seriously! The Golden Gate Bridge rises off its moorings and levitates across San Francisco Bay. Cars fly across mountain highways and burst into flames. A winged teenager crashes through a skyscraper window and soars above the city skyline. 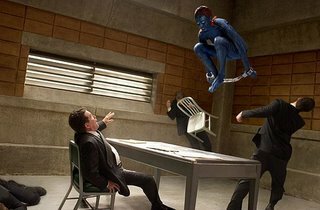 The perpetrators of these fantastic feats are the costumed heroes and villains of “X-Men: The Last Stand,” the third movie blockbuster based on the popular comic book. The X-Men formula of mutant teenagers with fantastic powers, one controls the weather, another can move through walls, battling baddies with their own superhuman skills is rock solid action formula. “X3,” directed by Brett Ratner, has sold $175.7 million worth of tickets in the U.S. in its first ten days of release, meaning that a lot of teenage movies goers are returning again and again. “X3” may also have just enough thrills to please that ardent art-house film buff in need of a movie void of any intellectual engagement. “X3,” boasting a villain named Juggernaut who crashes through cement walls like a human bulldozer, offers a sugary rush at all its best moments but there are some who look beyond the explosions. On a May 30 “National Public Radio” story, commentator Mike Pesca says the “mutantism” in “X3” represents real-life issues ranging from dwarfism to deafness and sexual orientation. He’s not the first person to place sociopolitical issues atop the film’s constant special effects. “X3” actors have been discussing the film’s human rights philosophy during their pre-release publicity appearances. Halle Berry, who plays the X-Men leader Storm, flashes eerie white eyes that match her dyed hair whenever she uses her powers to manipulate the weather. Toss in Berry’s body-hugging leather jumpsuit and it’s almost impossible to take her seriously. Sometimes, a comic is simply a comic. Any political debate around “X3” feels like an awkward stretch.